Whether it comes from magazines, newspapers, the web, TV, radio, or social media, we are awash in national media headlines all day, every day. For many of us, the national news cycle can sound like a monotonous drone of negativity and fear. This is a huge part of why our local news outlets are so important. Local news can ground you in reality – the reality of our actual community – which often isn’t nearly as horrible as many national news feeds would lead you to believe. Good homegrown voices won’t shy away from our community’s challenges, but more importantly they connect us directly to the people and organizations all around us who are working to make good things happen. But when it comes to media, how local should “local” be? Ideally, local news outlets are genuinely local – that is to say they’re independently owned outfits closely tied to the community from top to bottom. They develop local management perspectives, make decisions locally, and maintain the strongest ratio of revenue kept in the markets they cover – revenue they often reinvest right back into the community. But more and more, this utopian scenario just isn’t the case. Local news organizations are now frequently a small cog in a much bigger national corporation that may or may not have an interest in what’s best for the communities they serve. And it’s true here in the Chippewa Valley, too. In fact, the trend continued this past summer when Volume One suddenly found itself positioned as the largest independent, locally owned media company in the Chippewa Valley. The change happened when our region’s daily paper, the Leader-Telegram, a 136-year-old, family-owned independent newspaper, finally sold to a much bigger conglomerate. They were bought by Adams Publishing Group, part of a Minnesota-based corporation. Adams owns nearly 100 different publications, plus billboards, radio stations, and more, spread across the United States and Europe. It’s a move that supporters would say strengthens the position of the paper going forward. But as the script often plays out, shortly after the purchase and a round of PR about employees keeping their jobs, Adams released several long-time Leader-Telegram employees in a bid to tighten the belt. It’s disappointing our community no longer has an independent daily newspaper, but it’s not surprising. In fact, the former ownership of the Leader-Telegram deserves some credit for holding on as long as they did. The drumbeat of buyouts across the country has been getting louder for quite some time. Most papers in communities like Eau Claire lost their independence years ago, getting snatched up by any number of much larger corporate competitors. After the buyouts, papers are frequently slimmed down – in staff size, page counts, and more – through a centralized push toward profitability. Whether or not a paper’s local coverage stays strong is hard to say. In some cases, it can improve. But in many others, not so much. As for the Chippewa Valley’s media landscape, all of our major media players are part of much larger conglomerates run from as far away as Georgia or Texas. WEAU TV-13 is owned by Gray Television out of Atlanta – they own more than 100 TV channels across the United States. WQOW TV-18 is owned by Quincy Media out of Illinois – they have 20 stations, plus some newspapers and radio stations. The Chippewa Herald and Dunn County News are owned by the enormous Lee Enterprises out of Davenport, Iowa, which produces nearly 350 publications in 23 states. The vast majority of our radio stations are owned by two companies – Mid-West Family Broadcasting (a roughly 40-station group out of Madison), or the behemoth of all media groups, San Antonio’s iHeartMedia (formerly Clear Channel), which owns more than 850 radio stations around the country, plus billboards, entertainment producers, and more. All of that leaves Volume One at the top of a heap of smaller, niche media outlets here in the Chippewa Valley, outfits that are in fact locally owned. We’re now the biggest of the small. After our recent hiring run of four new full-time positions, Volume One currently has 28 people on the payroll of our media, retail, and event operations. 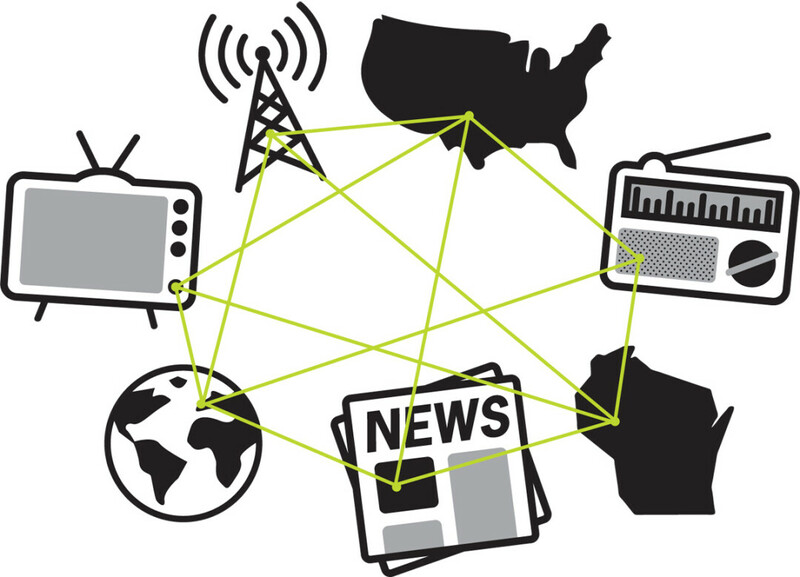 While our print and online publications reach a significant and growing number of people throughout the region, by-and-large the majority of news and information consumed by area residents is produced by an array of remotely owned media entities. On the business side, that means a significant chunk of local businesses’ advertising dollars heads right up those chains and out of the community. Frankly, in the local business world – and here’s where my own bias comes in – it’s the same as spending your money at a national chain restaurant, shopping at a big box retailer, or buying goods online instead of at local independents. It’s fine, it supports some local salaries, but the true economic impact is limited. However it’s still better, from a community standpoint, than when a local business only advertises with Facebook or Google. But I digress. Thankfully, there are many good people doing great work with media organizations throughout the Chippewa Valley. Many of these aforementioned outlets still have local newsrooms filled with talented reporters, anchors, and producers helping tell the tale of our communities to great effect. They have sales staff that understands this community and their clients well. And there’s no doubt that in some cases, those large corporate owners may give significant leeway and support to their local managers to operate in a way that truly serves their community, perhaps even with more impact than a local independent could provide. So the value of these organizations to their communities, regardless of the locale of their ownership, can still be immeasurable. All that said, it’s still hard to watch local ownership disappear from a community’s media outlets. With the Leader-Telegram, I always felt a sense of pride that our local daily paper was independent. It was a rare badge of honor for the Chippewa Valley. In the case of TV and radio stations, those are expensive endeavors, and in many cases it’s very difficult to keep them independent of corporate parents. So sometimes, corporate ownership just comes with the territory. But on some level, local media should belong to the locals. These outlets are here to tell our story. To engage in an ongoing dialogue with the community in which they operate. That goes for Volume One, WEAU, Leader-Telegram, and all the rest. How well each one does it depends on how much the public speaks up – with our voices, our advertising dollars, and of course, our attention. And if they want to survive, they’ll respond. Regardless of from where they’re owned.